The belfry of the clocktower is located above the dials at a height of about 200 feet from the ground. It is indicated from the outside by the large Gothic arches as shown. There are five bells in the belfry of which the most famous is Big Ben, the great hour bell which weighs 13.5 tons. The bells were designed by Denison in 1852. 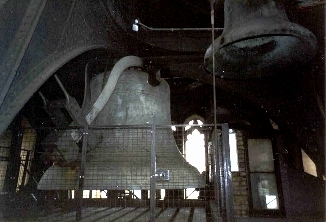 The four chiming bells were cast by the firm of John Warner and Son in their Cripplegate foundry and the hour bell was cast in their Stockton-on-Tees foundry. An error in the preparation of the mould resulted in the bell weighing 16 tons, 2 tons in excess of the design weight! The nickname 'Big Ben' was applied to this bell after it was delivered to the New Palace Yard in London, where it was hung and struck regularly for the benefit of the public as the clocktower was not yet ready to receive the bell. After about one year, the bell cracked while being struck by its hammer. Denison claimed the casting was bad but the manufacturers denied this, claiming that the hammer used to strike the bell was too heavy, weighing 6 cwt. The bell was broken up and recast by George Mears of the Whitechapel Bell foundry and Denison accepted the new bell as satisfactory. At this stage (1858) the work on the clocktower had been completed and it was no longer possible to hoist the bell up the outside of the tower. Instead, it was necessary to raise the bell up the central shaft of the tower. This resulted in two inconveniences, (i) although the clock movement was completed in 1854 it could not be installed even when the clockroom was complete as it had to stand over the central shaft, and (ii) the dimensions of the central shaft forced Denison to have the bell cast to unusual dimensions so that it would be possible to enclose it in a wooden cage and hoist it up the shaft on its side. 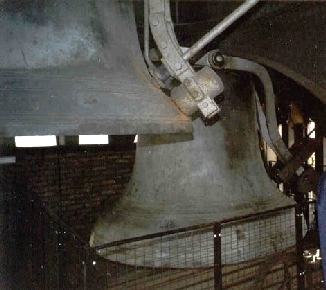 The raising of the bell took 36 hours and it was hung in the centre of the belfry surrounded by its four 'small' quarter bells as shown below. The hour bell began striking the hours in July 1859. However, disaster struck in September of that year when the bell cracked under the force of the same 6 cwt. hammer. Denison was subsequently involved in a legal battle with the manufacturer who claimed that it was Denison's fault for using too heavy a hammer. Eventually analysis of the bell metal revealed an inhomogeneity in the composition of the metal but it was now 1862 and the bell had been out of action for all this time with the hours being struck on the largest of the quarter bells. The great bell was never recast, but was given a quarter turn so as to allow the hammer to strike on an undamaged surface and a lighter hammer, weighing 4 cwt. was substituted. This is the bell as we hear it today.